Jackson and I have both been home since the baby was born and today we hit the 6 week mark. Six weeks ago our little Jax entered our lives and things havn't been the same since. We've been getting a little stir crazy so we decided to take advantage of the beautiful spring weather and cheap tickets and took Jax to his first baseball game today. There was a double header titled the "Florida Four" featuring University of Miami vs. USF followed by FSU vs. UF. 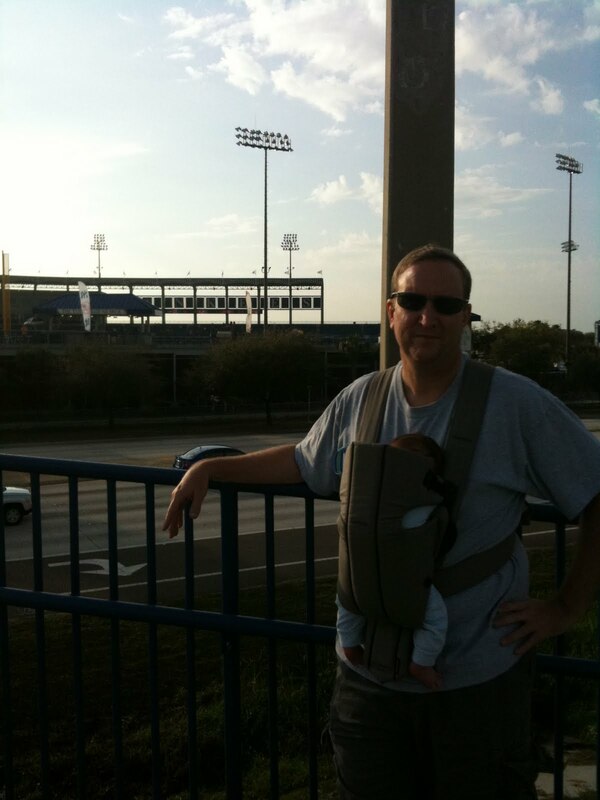 Seeing as how I am a Miami/FSU fan and Jackson is a USF/Florida fan we figured we'd get the little man started early. 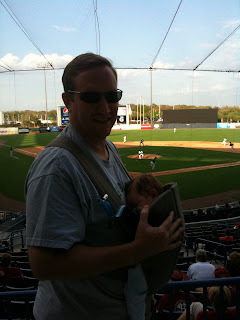 We headed up to Steinbrenner field and had wonderful seats. Jax was sleeping when we got there and even slept through the 7th inning stretch! He woke up and ate and flirted with the couple behind us for a while and then watched some of the game with daddy, wearing his USF shirt. Unfortunately, the Hurricanes lost the game, but my teams had a chance to redeem themselves with FSU up next. We ended up leaving during the second game because the temperature dropped and the wind picked up and we were COLD! 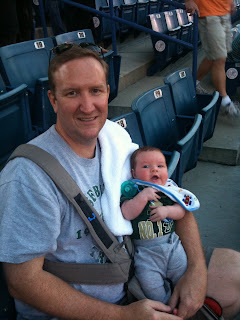 All in all we had a wonderful outing and we look forward to many more days at the ballpark with Jax. 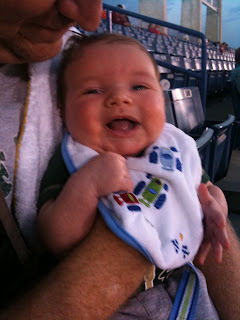 I think he really enjoyed the game!